Say NO to the Status Quo—Full Equality for All Women! Aug. 26 marks Women’s Equality Day—a celebration of the hard-fought struggle for women’s suffrage that was won in 1918. Today, almost 100 years later, women have made many gains in the struggle for equality. Almost 100 years later, the struggle for full equality continues. There is much that has not been won. In 2014, women are still paid less than men for equal work; Latina women are paid 55 percent of what men earn, Black women 67 percent and white women 78 percent. Worldwide, 35 percent of women experience sexual violence. Society then sweeps sexual violence under the rug—shaming victims and protecting attackers. Marissa Alexander’s case—among many others—highlights the contradictions of a society that punishes victims of abuse when they defend themselves. Marissa Alexander is a 33-year-old African American woman, mother, and survivor of domestic violence. Under mandatory minimum sentencing laws, Marissa was sentenced to 20 years in prison for defending herself against an abuser in the same state that let George Zimmerman walk free. Though the original sentence was thrown out by the judge, Marissa is still being prosecuted and State Prosecutor Angela Corey has announced she intends to seek a 60-year sentence. All charges against Marissa should be dropped! We must stand with Marissa, demand her freedom, and fight to end all forms of violence against women! Recently, reactionary politicians and groups have targeted our reproductive rights—trying to overturn Roe v Wade through federal and state legislation that denies women the right to abortion, denies us access to birth control and criminalizes certain behaviors for pregnant women. There is an ongoing offensive to defund Planned Parenthood and other centers that provide not only reproductive health care, but also critical preventative health services. The latest attack has come in the form of the Supreme Court’s decision that Hobby Lobby’s owners’ religious convictions were more important than the reproductive health care of the women who work there. Women’s bodies belong to no one but themselves. We should have the right to control our own bodies, and determine how and when we get pregnant and give birth. Access to abortion and birth control are part and parcel of reproductive health care—and shouldn’t be isolated from health care in general. Likewise, women look forward to the day when we are safe to walk down the street, and when our bodies are not objectified and commodified. We are struggling for a day when we are not paid less just because of our gender or more likely to live in poverty because of it. That day is entirely possible. But is only possible if we organize and mobilize to challenge the status quo that perpetuates and institutionalizes inequality. Join WORD in building the struggle for full equality. 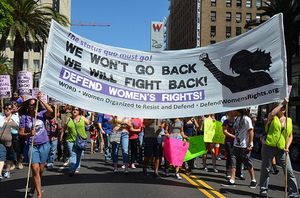 On Women’s Equality Day, WORD (Women Organized to Resist and Defend) will be holding speak-outs, forums and other actions to celebrate the gains demanding “Say no to the status quo—full equality for all women!” Join us in cities across the country between Saturday, August 23 and Friday, August 29, 2014. Attend an event in your city or organize one. Join WORD on August 23 - 29 in a city near you or call an action in your city and add it to the list! Events are being added every day! Friday, Aug. 29, 7 p.m.
Tuesday, Aug. 26, 6 p.m.
Friday, Aug. 29, 5:30 p.m.
Tuesday, Aug. 26, 5:30 p.m.
Meeting up at 2295 7th Ave, departing at 1 p.m.
To list your Women’s Equality Day event, email us at info@defendwomensrights.org to add details of your event!